The porch garden is growing like crazy, and it has been fun to see the progress every day. We now have 1 almost ready-to-use jalapeno, the early girls are big and green, the carrots are officially out of control (we didn't thin them), and the basil is delicious. Last Sunday we had some funky weather and it dropped down to 51 degrees, and then started hailing like crazy. 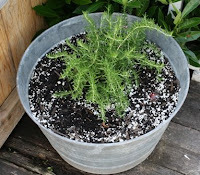 I was a little worried about damage to the garden, but it didn't seem to show any ill response, although the storm brought out a million snails and slugs. Immediately I ran out there with my Sluggo and tried to protect my crops, but then I went for the easier route and had Justin go out there and pick them all off and throw them to faraway lands... We only ended up with a few holes in some of the leaves of the zucchini, so crisis averted for now. (L) summer squash, cucumber, summer squash, watermelon. (R) eggplants. 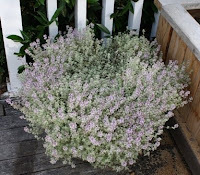 (L) Silver Thyme, in bloom. (R) Rosemary.